One early Spring morning two young brothers were arguing about who was the family favorite. Dad overheard the boys and asked them to walk outside with him to the garden. It was time to plow and get ready for planting. The family was poor though, they had no tractor, or horse to pull the plow, so Dad just put the harness on the boys, one to the front and the other to the back. He then asked them to plow the garden. The boys usually enjoyed working in the garden, but this time each wanted to prove who was the best, so they pulled with all their might. They tugged, and groaned, and pulled and pulled – in the opposite direction. Needless to say, when Dad came back to check on their progress, the plow, and the boys were still in the same spot. 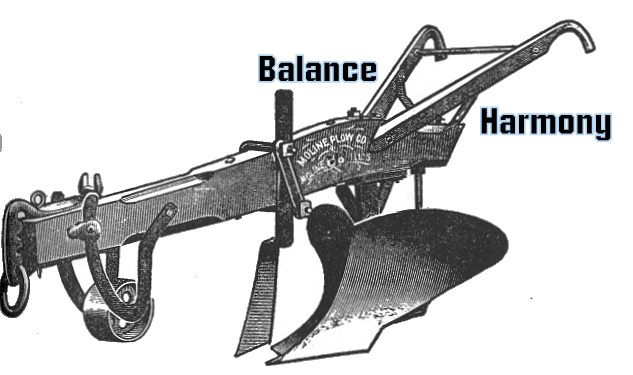 Dad’s lesson about balance harmony still influences my life today. See, Balance is like two opposing forces, both equal, and going nowhere, while Harmony is diversity making sweet music together.